So you’ve been sitting there all week green with envy, have you? 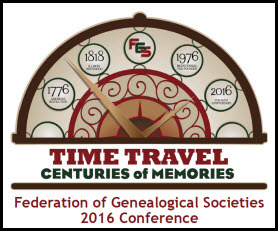 Watching people post from the 40th annual conference of the Federation of Genealogical Societies in Springfield, Illinois, while you’re stuck somewhere far away? Perhaps cursing the boss who scheduled that meeting just before the Labor Day weekend. Or the school board that decided the kids had to go back to class before Labor Day. Whatever the reason you had to miss the FGS conference, you don’t have to miss all the fun. There’s still a way for everyone at home — and conference-goers who had to make an agonizing choice between this session and that session — to get in on the conference at least a little. That’s because many of the conference sessions are being recorded, and you can buy one, a bunch or all of the recorded sessions to listen to in the comfort of your own home, and on your own schedule. In a day or two (or three or 10), head on over to the Fleetwood Onsite web page for FGS. The page link is here. Now if you go there this minute, you’re not going to see the 2016 conference. That’s why I said have patience. The company needs to verify the recordings and get them and the ordering system up once the conference concludes. But once you see the 2016 conference at that webpage, you’ll be able to get recordings of some of the very best and brightest of our community’s speakers talking about a wide variety of topics. • DNA and the Genealogical Proof Standard, presented by Blaine T. Bettinger. • Chicago Research: Planning is the Key to Success, presented by Jeanne Larzalere Bloom. • A Family of Fiends: An Antebellum Tale of Southern Murder, presented by Jordan D. Jones. • Can a Complex Research Problem be Solved Solely Online?, presented by Thomas W. Jones. • German Genealogy on the Internet: Beyond the Basics, presented by Michael D. Lacopo. • Using Tax Rolls to Prove Births, Deaths, Marriages, Parentage & Origins, presented by Elizabeth Shown Mills. • Irish Immigration into the Midwest, presented by David E. Rencher. • Using NARA’s Finding Aids and Website, presented by Pamela Boyer Sayre. • Lost in Australia, presented by Helen V. Smith. And when the website ordering system goes live, you’ll be able to see a lot more choices of a lot more speakers and topics. My green just paled down to a hopeful yellow, Judy. I used to believe I was a patient person, but friends and family laugh at that. I’ll mark my calendar to check the site in a week. It sounds like it was a very satisfying conference. I’m certain I’ll be buying several! Cheers. There were some really good talks… I’m sure you’ll find more than a few to buy! Judy, can one get copies of the syllabus/handouts that went along with the recorded sessions? Thanks. I don’t think so, Carol. That’s the value-added for folks who pay up to actually attend the conference and make it possible for the recordings even to be made. As of Sept. 13 they have the recordings available. You can get a flash drive or CD of ALL the lectures. Price is $249. Which is less than registration if you paid for the full conference in Springfield. Every lecture in audio only. Individual lectures are $10 each for a download.